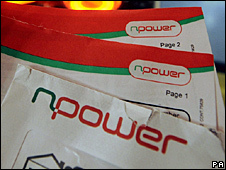 Utility firm Npower has suspended 17 staff following allegations in a newspaper over sales tactics. An undercover reporter for The Sunday Times claimed some sales staff misled potential customers. The Worcester-based company said it had suspended a sales team and launched an investigation by a separate department into the newspaper's claims. It said it was shocked by the report and said staff found to have defrauded customers would be sacked. Its spokesman Richard Frost said: "Let's just be absolutely clear, if there is any evidence of fraud, if any of our people have been indulging in fraudulent activity, then there are no ifs or buts, people who conduct fraud will be dismissed from Npower." He added that the internal inquiry would be carried out by employees not connected to the sales department. Mid-Worcestershire Conservative MP Peter Luff, who is chairman of the Commons business and enterprise committee, called the claims "worrying". He said: "First of all, Npower must do its own internal investigation urgently. "Secondly the energy regulator Ofgem is going to have to look at this as well and establish exactly how worrying the situation is. "Thirdly, my own committee, which is doing its own inquiry into energy prices, will want to look at this to see if there is evidence of a badly-functioning energy market in which people are paying too much generally for their electricity."